possibly another little street will have to get the maps out .I think Mark St was a little bit further back in the photo. Hi Biff i remember the incident with the policeman it was about 1962 i think? I used to live behind West Ham Police station in the 1950s. I remember the old police cars going by just like, No hiding place T V Series. also the Noddy Bikes and then Panda cars and Ford Capris with a red stripe on the side, i think they called them jam sandwich s and Rover 2000 s.
West Ham police Station has moved further down west ham lane towards the Town hall on the corner of Bryant Street its now called Stratford police Station for some reason, it was built on a Bomb site , i think it was a large sort of Church and hall that got bombed, we used to play on there as Kids. Poppy. I did check the 1893-95 Ordnance Survey map and apart from Tthe Swan, no public houses are shown behind it. The building arrangement behind The Swan is also shown as being different on other Ordnance Survey maps before and after Tramway Avenue was created. I can only assume The Victoria came into being after the construction of Tramway Avenue. 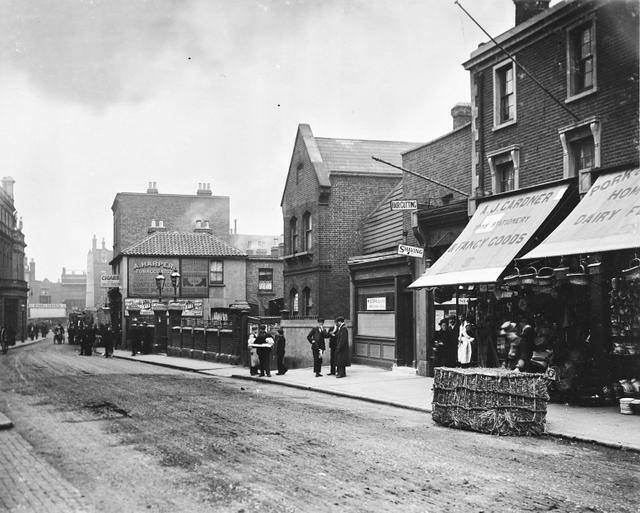 Hi, West Ham Lane was where I took my motorcycle test in around 1953 ish. I cannot remember where the centre was, but I can recall there being a cinema on the corner of the test route. In those days the examiner ran around the route, hiding in doorways & jumping out in front of you for the emergecy stop, brave man. Hi Mick had look at my map before 1902 and it shows Victoria St and the pub the princess Of Wales it looks like they built tramway avenue just after the pub , i think the pub must just be out of shot in the photo, the pub is now called the secret Weapon. Hi Ed, you dont hear of nippers having their tonsils out theses day, I wonder why, could it be that antibiotics have become more widely used? I have been told that you were given ice cream after the op, that must have been a treat in those days. There also was a Gaumont Cinema in Stratford broadwy opposite the town hall. Hi Harry, the Gaumont cinema, is that the one where the buses stopped right outside the main door? A favourite of mine, as you could often nip in through the exit doors. Broadway Cinema, Tramway Avenue, later renamed The Gaumont. Tramway Avenue, Bus stop out side Gaumont Cinema. 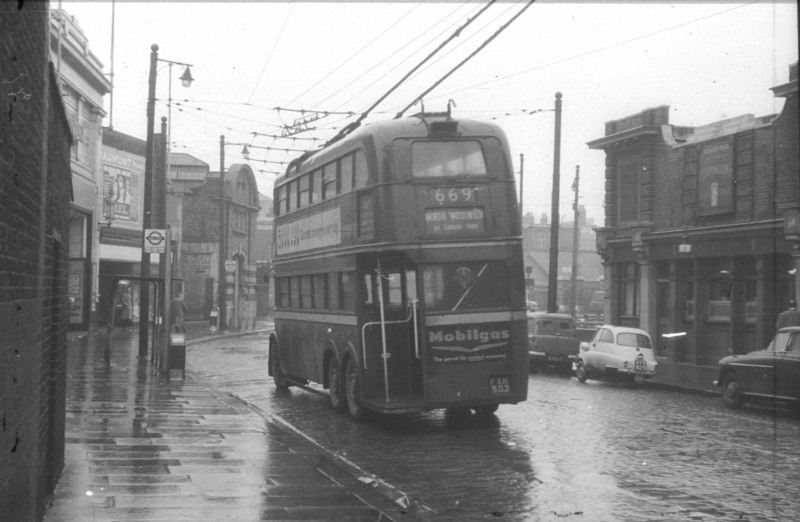 Hi MickG, a great photo of a trolley bus, why did they ever do away with them? Quiet, fast & not smelly. I used to catch the 699 from the Connaught terminus, a nice hassle free journey. Hi Ken one of the men who worked at Butterfields left and took a job driving the old trolly buses and used to tell us the story of Dockers trying to jump on the bus as it turned the corner from Victoria dock road into Prince Regents lane he said he would accelerate hard to see the docker hanging on for dear life as he sped away.Regards Harry.I. Hi Harry, that corner was a ninety degree turn & if the driver wasnt careful the overhead poles would come off & swing about, the passengers would utter a few cockney words of displeasure at the delay. The pawnbrokers shop on that corner always had a queue outside on Monday mornings.